Studying for the math GED test can be hard. There’s a lot to remember, and if you don’t know where to start, preparing for the test can be tricky. But it doesn’t have to be! We created this GED Math study guide to help. If you’re nervous about your GED math test, you’re not alone! We’ll help teach you how to pass GED Math and the other subjects with this free study guide. After reading this guide, take a free practice test so you'll know you’ll be all set to take on the GED Math test. Is the GED Math test hard? This all depends on how prepared you are. If you’ve taken the time to study for the GED Math test, it won’t be that difficult. The hardest part of earning your GED is making the decision to do it! Once you’ve done that, the rest is as simple as following this guide and putting forth a little time and effort. What math topics do I need to know for the GED math test? The GED math test covers some of the more important math topic that everyone who earns their GED should know. The general topics on the GED math test are Basic Math, Geometry, Basic Algebra, and Graphs & Functions. How many questions are on the GED Math test? There are 46 questions on the GED Math test. These questions are split into the two parts; 5 questions on the first part and 41 questions on the second part. These questions are a mix of multiple-choice, multiple-select, drag-and-drop, matching, fill-in-the-blank, and table entry. These question types are explained in more detail below. How long is the GED Math test? You will have 115 minutes to complete both parts of the Math GED test. What score do I need to pass the GED math test? To pass the Math GED test, you only need a minimum score of 145 points. Each subject on the test is scored on a scale of 100-200, so you only need to get about 45% of the questions right in order to pass. Can I use a calculator on the GED Math test? You do not need to bring a calculator when you take the GED. An embedded Texas Instruments ® TI-30XS on-screen calculator will be available for some of the math questions. Questions on basic math skills such as multiplying decimals, adding fractions, using long division, exponents, and other foundational math skills will not have the onscreen calculator. Is there a practice test I can take to see how much I already know? Use our GED Math practice test (2019) to try some questions similar to the questions on the GED math test. Is there a GED Math book available? Yes. Our Essential Math Skills workbook is a valuable resource for preparing for the GED math test. This book has a high rating on Amazon® where customer reviews show appreciation for its focus on problem-solving skills instead of just memorization. Is there a PDF version of this guide available? Yes. You can easily download the GED Math Study Guide to reference anytime. Is there a formula sheet provided when I take the GED Math Test? Yes. You can download the Mathematics Formula Sheet & Explanation that you will have access to while you take the GED Math Test. Multiple-choice: This is the most common type of assessment question. Multiple-choice questions ask the student to choose one correct answer out 4 or 5 possible answer choices. Multiple-select: This type of question is a little different than multiple-choice. Multiple-select questions ask the student to select all of the correct answer choices among a number of choices. Instead of having just one correct answer, there could be 2 or more correct answers. Fill-in-the-blank: This type of question asks the student to type their answer into a box after the question, or a box that is part of a sentence. In math, the answer is often numerical but sometimes can be a written word or short phrase. Drag-and-drop: This type of question has “draggable” answer options. 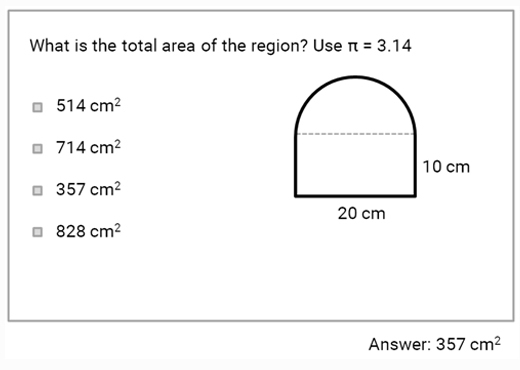 When the student clicks and holds on one of the draggable options, they can drag it to a “target” region to answer the question correctly. Sometimes there might be two or more target regions. Matching: This type of question asks the student to check a box when the information in a column matches the information in a row. For example, one column header could be “true” and the other “false.” Students would read the information in a row and check whether that information is true or false. Table entry: This type of question is usually used for a table of values with two columns. Certain cells in the table will have a box where the student types in a number so that the table is correct. Math is a broad subject that covers lots of different kinds of math. But what kind of math is on the test? Here are sample GED questions with answers. Numbers and the four operations--addition, subtraction, multiplication, and division--is the foundation of math. This is called “basic math.” There are many different kinds of numbers such as whole numbers, decimals, percents, and fractions. Basic math also includes exponents and finding square roots of numbers. 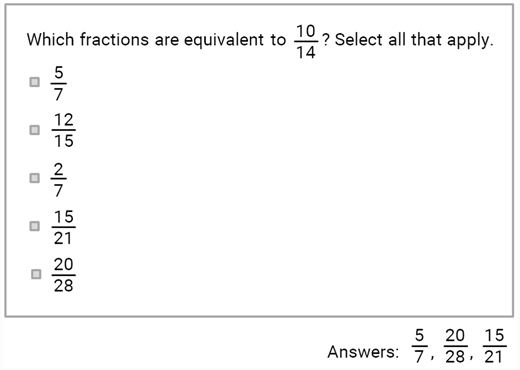 Try to answer this sample GED math multiple-select question on Basic Math below. Shapes are an integral part of math. The GED exam will ask questions about different types of shapes and how numbers relate to those shapes. Learn about circles, triangles, quadrilaterals, cubes, prisms, pyramids, cylinders, and cones. Questions will ask you about the area and perimeter of two-dimensional shapes, and the volume and surface of three-dimensional shapes. Try to answer this sample GED math multiple-choice question on Geometry below. 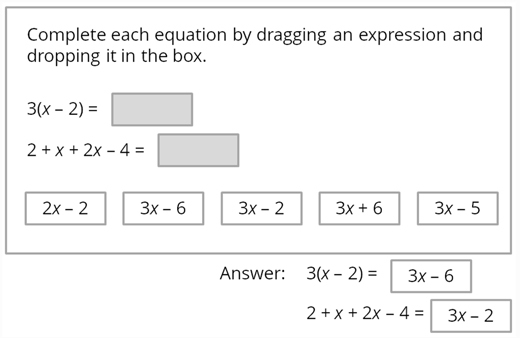 Try to answer this sample GED math drag-and-drop question on Basic Algebra below. Functions have to do with inputs and outputs of numbers. To be able to demonstrate your understanding of functions, you need to know about the coordinate plane, basic graphs, function notation, and identifying functions. The GED exam will ask questions about all these aspects of functions. Identifying points in the coordinate plane, graphing lines and inequalities in the coordinate plane, identifying functions, interpreting graphs, evaluating functions. 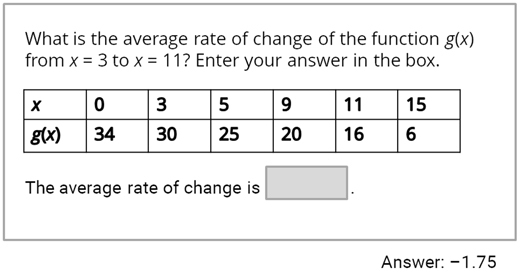 Try a sample GED math fill-in-the-blank question on Graphs & Functions below. Take notes: Write down information as you move through material on your own or during classes. The act of taking notes engages you with the study material beyond just hearing, reading, or seeing information. When you take an action, more of your brain needs to turn on. You're doing something, so you're focusing more. Get organized: Put your notes in logical order, or an order that makes the most sense to you. Highlight, circle, or underline important information. As you review and organize your notes, the information from the notes is refreshed in your mind and organized mentally. Review it: Fill in your notes with any missing information. Make a list of the key words from your notes. List any problems you're having with the material, or identify sections in your notes where the material seems unclear. Make an outline of the information so that you see the relationship of ideas and facts to each other. Make another list or outline that includes all the information you feel you've really learned. Determine how you can use this new knowledge in real-life situations. Now, review material that was unclear, and you'll probably discover that it's clearer. Do you have trouble finding time to study? Like most GED students, you probably have a busy schedule! If you have a phone or tablet, you can take advantage of a few minutes each day to study online for the GED test, the TASC test, or the HiSET exam. Even if you only have a fifteen minute break, many lessons are short so you can complete them during lunch or on your commute! Make the most of every minute! Attainable: This means you should set goals that reasonable. Think about your reality and your schedule. What would be a reasonable amount to study each week? Don’t set goals that are too hard to achieve, but also don’t make them too easy. Push yourself a little bit, but know your limits. Measurable: This means set goals you can measure. These goals should be as specific as possible. Something like “I’ll study five hours this week” is easy to measure, but something like “I’ll get better at math” doesn’t have a specific goal post. You want your goals to help you see your progress, so if your overall goal is to get better at math, maybe set yourself specific goals that would help you achieve that like “I’ll study five math lessons this week” or “I’ll complete the fractions unit this week.” The more specific your goals, the easier they are to accomplish. Within Your Control: This means set goals you can control. “I’m going to pass my Math GED test in June” is hard to control. You don’t know if you’ll pass or not. Instead, set a goal like “I’m going to take my Math GED test June.” That means you need to prepare for the test by June so you can be ready to take it. Don’t forget to make smaller goals to help you get there! Trying and failing serves a purpose! Getting the wrong answer gets your attention and gives you incentive to learn. It shows you where you need to go. Understanding that a wrong answer isn't "bad" can help a lot. Many learners get frustrated with wrong answers, but think of a wrong answer as a learning tool, another step toward earning your certificate. So, how can you use wrong answers as learning tools in your studying? When you're studying a topic, don't be afraid to test yourself, and don't be afraid of difficult questions. Give answering your best shot, and then, if you get the wrong answer, find out why. Getting the wrong answer will actually help you learn better. Don’t skip brain day! Think of learning like exercise--if you sip a day, it’s harder to go back the next day. Even if you only study for a few minutes, it helps build a routine and reinforces your mental pathways that help with memory. Make it a goal to study--even just for fifteen minutes--every day. This will keep your brain active and your memory strong! Taking the Math GED Test. The most common reason for a mistake is that you didn’t understand the question. Read each question thoroughly--especially word problems, which can be tricky--to make sure you know what it’s asking. If you’re not sure, read the question again to double check. If you’re not sure about an answer, a great way to narrow it down is by eliminating the answers you know aren’t correct. This reduces the number of options, and improves your odds of guessing right! If a question has you stumped, don’t be afraid to skip it. You can flag it and come back to it later. You only have so much time on the test, so answer the questions you know you can answer correctly first. Word problems are sometimes confusing--there’s so much information being given, and it’s hard to figure out exactly what’s the question is asking. Try simplifying it in your own words, eliminate unnecessary information, and rewrite it as an equation before solving. You have 115 minutes for the Math GED test. Don’t rush through the questions--use the whole 115 minutes. If you finish before the time is up, go back and check your answers! Study with your classmates! Just because you study online doesn’t mean you have to study alone! Our online GED Academy provides you with a virtual classroom and tutor along with fellow students. These characters will walk you through each video lesson and share their struggles along the way. Study on-the-go! You can access your homeroom anywhere, anytime, so you can do practice questions or take lessons on your phone during your lunch break, or while waiting in line. Take your learning with you everywhere, across multiple devices. Every minute counts! Study on your schedule! You get to decide when to study. Fit your learning around your busy day. There are never any deadlines, and you can decide when to take breaks - no pressure. Setting study goals is alway encouraged, but you're never penalized for not meeting them. Study at your own pace! We understand that everyone’s learning style and speed is different. Get your own personalized, customizable learning plan by taking the assessment test with our GED Academy. Your personalized learning plan will determine what lessons you need and which ones you don't. Your learning plan will adjust to you as you move through the course, giving you review lessons if you need some extra help. Math Study Guide by Leonard Williams is licensed under a Creative Commons Attribution-No Derivative Works 3.0 United Stated License, redistribution of this article is allowed under the following terms outlined here.